Being from the West Coast, the South has always been a mystery. I’ve only met a handful of people who have ever been and the only references I heard to the South growing up were in American history classes. Obviously, I have always wanted to visit the South to determine what rumors are true and what rumors are not (Spoiler alert: it’s a combination). Since moving to the Midwest, I have tried to explore the region around St. Louis, which includes a large swath of the South. I have always wanted to go to a football game in the Deep South. Luckily, the University of Mississippi, aka Ole Miss, was playing a game against the University of Missouri, aka Mizzou in Mississippi. Luckier still, when discussing my weekend plans with my friend, Julie, she told me that her good friend goes to Ole Miss. So Julie and I decided to go down to Oxford for the game. The route. 5 hours 45 minutes driving time. After leaving Missouri and driving through Arkansas, we stopped in Memphis, Tennessee. We entered Memphis by crossing the Mississippi River into downtown while blasting “Walking in Memphis” by Marc Cohn. 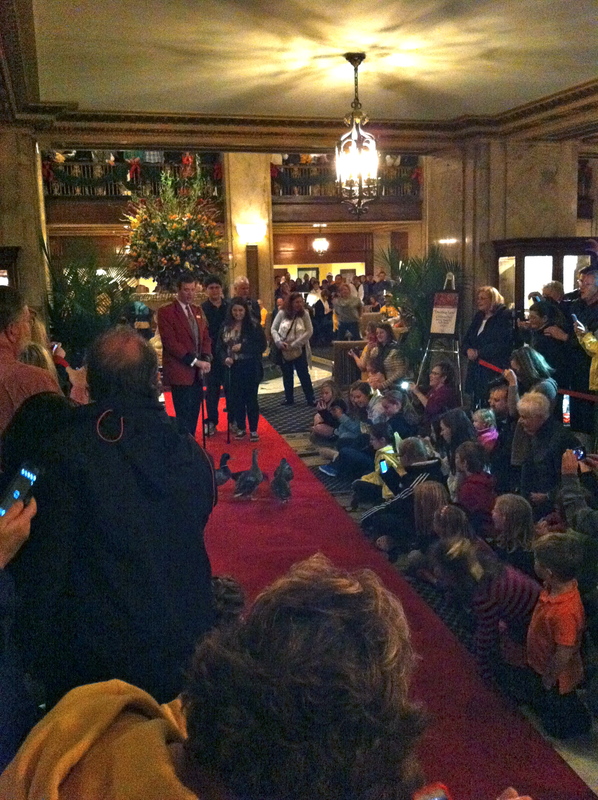 At 5 pm we went to the Peabody Hotel in downtown to witness the march of the world famous ducks. A crowd of at least 400 people were scrunched into the beautiful lobby to witness the Duckmaster herd about 7 ducks out of a fountain, down a red carpet and into an elevator which whisked them to their “Duck Palace” on the hotel roof. While the ducks did march into the elevator, I must say I was less than impressed by the ducks, but very impressed by the crowd that gathered and the Duckmaster’s presentation. Definitely worth checking out if in Memphis if only to say that you saw the ducks. Across the street from the Peabody Hotel is the ballpark where the Memphis Redbirds play. The Redbirds are the AAA Minor league affiliate of the St. Louis Cardinals. In front of the stadium, a crowd had gathered in front of a 35 ft. Christmas tree. A military band was playing Christmas carols and people were chatting and reveling in the moment. All of a sudden, a lady started to introduce the guest speaker, A C Wharton, the mayor of Memphis. The mayor started a countdown from ten. At zero, the Christmas tree suddenly lit up! The event was so cool because I had absolutely no idea what was going on until the tree was lit. Immediately after the lighting, the mayor started to walk out of the event, at which point I made my move. I positioned myself in his path close to the exit before reaching my hand out to shake his. “Thank you for everything you do for our city, Mr. Mayor. May I take a picture with you?” I said. He of course said yes. After taking the picture, he left with his entourage. 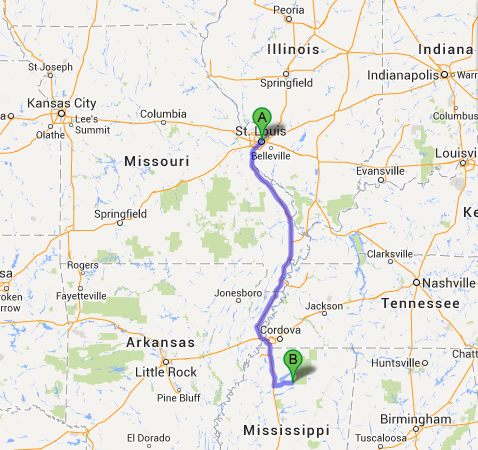 We then left Memphis for our final destination, Oxford, Mississippi, a 75-minute drive from downtown Memphis. We were staying at the home of Julie’s friend Kristin. The two met on a 6-week summer program in Tanzania. Kristin is the epitome of Southern hospitality. In addition to saying y’all at every possible opportunity, she always asked if everything was okay (it always was) and was always so friendly. Whenever she walked away, Julie and I would always look at each other and talk about how nice Kristin was. After eating dinner, we spent the next hour getting ready to go out (this is the South after all). For the first (and probably last) time in Julie’s life, she put in hairspray and teased her hair. We picked up some more people and went to a gas station to get beer. After buying the beer, I sat in the car with everyone else while Kristin bought some beer for herself. Right then an African American mom and 3 children walked in front of the car. One of the girls in our car then said, “I can’t believe this gas station is so damn sketch.” I soon realized that “sketch” is a commonly used euphemism for Black. 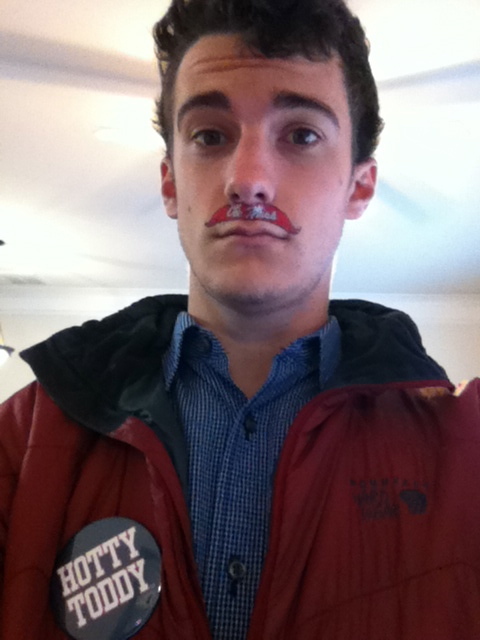 Alex is from Alabama and is a Southern gentleman. He is stoic, gracious, but has a hidden sweet side. His house was decorated in the classic collegiate fashion: with beer bottles in neat rows. From around 9-10:30, we played beer pong, drank causally, and mingled with the 10 or so people at the house. I tried to make an effort to talk to everyone at the house, but struggled to start a conversation. Unfortunately, I really didn’t know what to talk about and retreated to talking to Julie. Eventually, we were ready to leave for the bars. 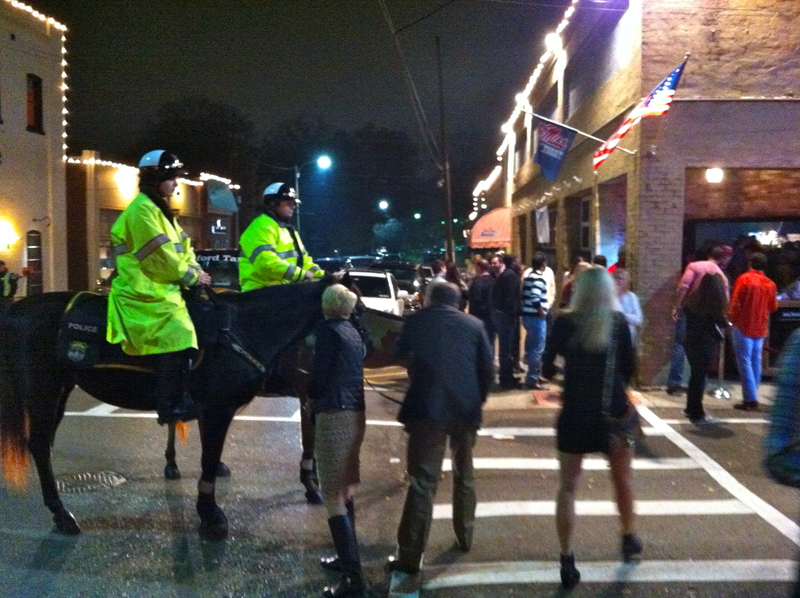 Oxford mounted police outside the bars in the Square. We hitched a ride to the Square, aka Oxford’s town square and the center of all nightlife in town. Because it was the night before the game, the bars were packed. Lines were 30 minutes long and covers were $5-20 to get into anywhere. About 25% of everyone there was a Mizzou fan (they were wearing Mizzou gear). The number of people out was astounding, as atmospheres like this do not happen in St. Louis. After deciding on which bar to go to for about 15 minutes, we eventually settled on a bar called the Levee. Because Kristin knew one of the bouncers, we were able to get in for free. The dance music in the Levee was very loud. Kristin decided to buy a round of drinks for everyone, which was really nice, but probably not the smartest move because she now had only $19 to spend for the rest of the weekend. After the drinks we ran into a friend of Kristin’s. This girl seemed very annoyed with the Mizzou fans doing their MIZ-ZOU chant but happily explained that the bar then played the song “Dixie” to counter their chant. Later I would learn that “Dixie”, in addition to being the unofficial fight song of Ole Miss, was also the de facto anthem of the Confederacy. Some argue that it is a key part of Southern heritage, as it was written by blacks, and was a favorite song of Abraham Lincoln. However, I believe that the intent of the song 150 years ago is irrelevant. I believe that since most blacks and many whites find the song offensive, it should not be played. Just because a song is a tradition does not mean that it is a tradition worth keeping. 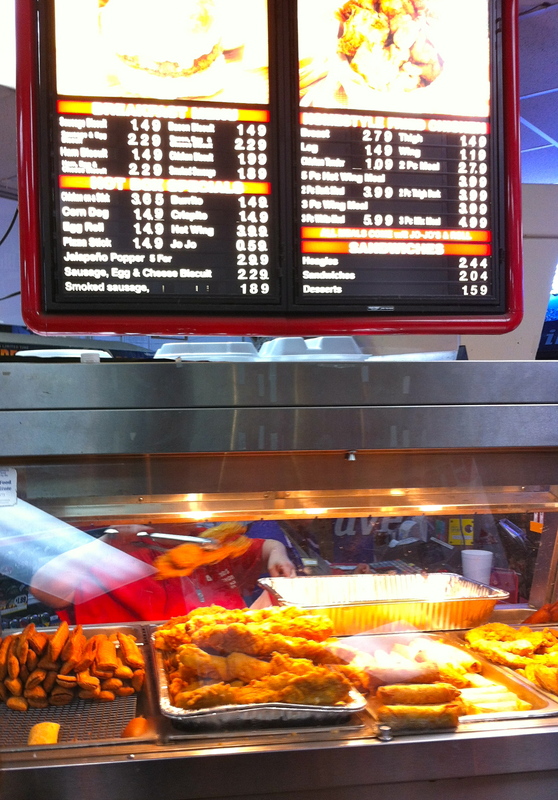 After the drink, we decided to walk home after about 30 minutes in the bar, stopping for fried chicken on a stick (yes it’s a real thing) at the Chevron gas station. When we got back, I asked if I had parked in a safe location. Kristin told me yes, so we walked in an all went to bed. Chicken on a stick! A glorious meal. The next day, Alex came over to help Kristin make breakfast. Alex made bacon, while Kristin made biscuits and eggs. After that, Alex went back home and the girls started getting ready. Two hours later, the girls were finally ready to go. Since the forecast for the day was a high of 48 degrees, Kristin decided to wear jeans instead of the usual sun dress. I wore a collared shirt and khakis. The four of us (Kristin, Julie, Kristin’s roommate and I) got in the car and drove to Alex’s house around 1 pm. We drank a bit at Alex’s house before walking over to the tailgate. 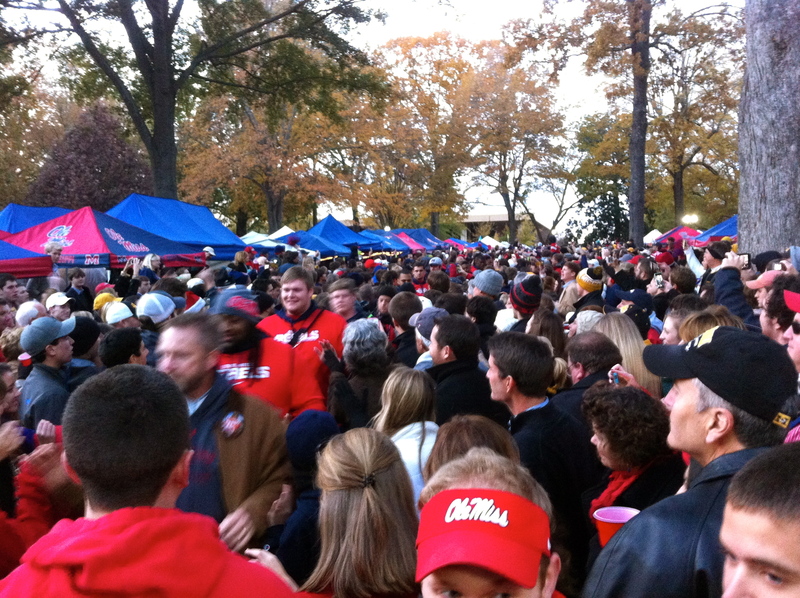 Ole Miss is famous for the Grove, a ten-acre forest in the middle of the campus that transforms into a red and blue tent city on game days. At 9pm on the night before a game, the authorities that be sound an air horn signaling the official start of the tailgate. The tailgating here is not your average BBQ in the back of the car. The tents here had walls, ceilings, crystal chandeliers, and Christmas lights. Everyone was drinking out of red or blue solo cups. Alex was able to let us camp out at a tent with people from Birmingham. They had a TV, space heaters, comfy chairs, lots of alcohol, and most importantly a chili buffet. I gorged myself on four bowls of chili and watched some of the other college football games going on that day. 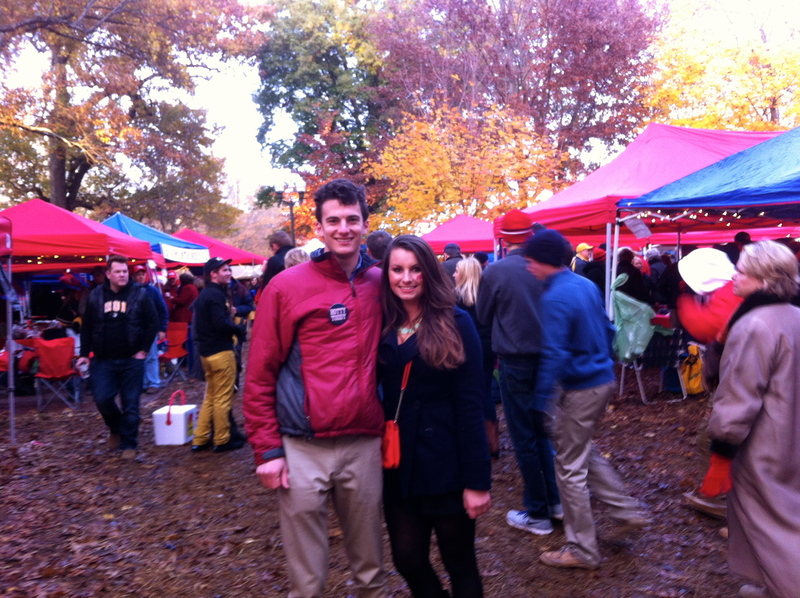 After a couple of hours in the tent, Julie and I decided to walk around the Tailgate of Tailgates. Pretty quickly, we stumbled upon a tent with a live 3-person brass band. They were rocking and there were quite a few people dancing and tapping their feet. 1. Mizzou travels well. There were about 25% Mizzou fans, which was a huge number for an away team. 2. Everyone who was not a Mizzou fan was dressed really nicely. 3. Lots of people wore these sorority buttons. That said something along the lines of Chi Omega Loves Our Rebels. I don’t really understand the purpose of the stickers, since lots of people unaffiliated with the sororities including lots of older men wore the buttons (I wore a Tri-Delt sticker), but I suppose it reaffirms the social importance of the Greek system. 4. 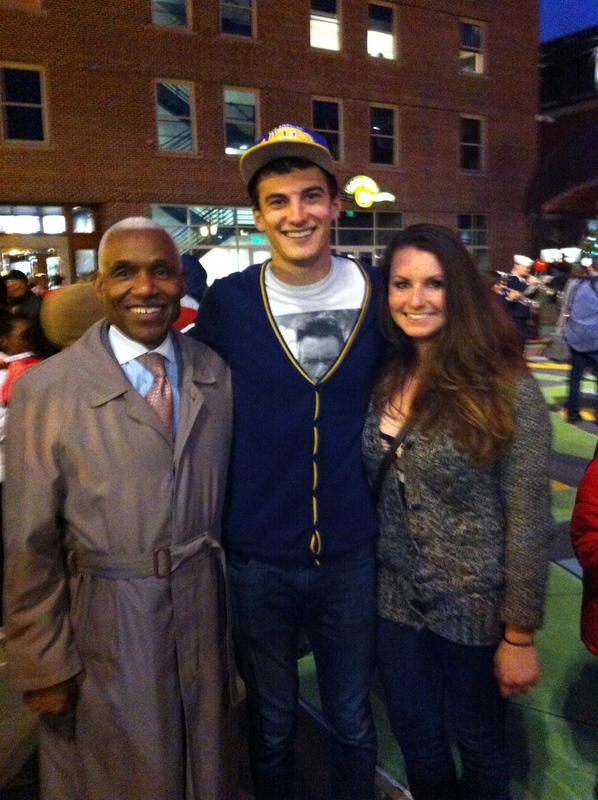 Everyone I met was incredibly friendly and wanted to hear my story. Southern hospitality is no joke. 5. 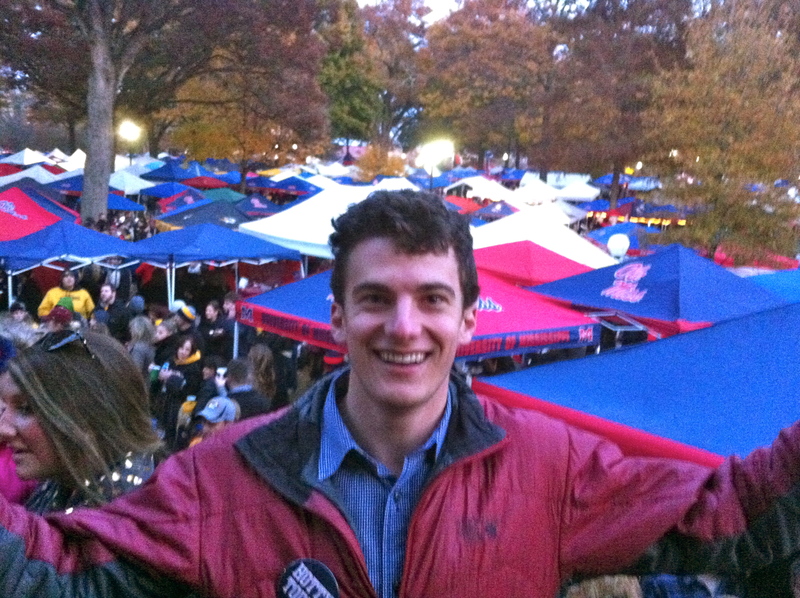 Excluding the football team, I saw no more than 10 African Americans at the entire tailgate of at least 100,000 people. 7. The Ole Miss Rebel mascot is actually a Confederate soldier?!?! Well, it used to be, until the NCAA made them switch it to a Rebel Black Bear, but most people still consider the mascot to be Colonel Reb. Actually, I’m quite surprised I didn’t put two and two together earlier. Also, the unofficial Ole Miss flag is the Confederate flag but the stars and bars are in the shape of an M. Also, the Mississippi state flag has the Confederate flag in the corner. Maybe, Mississippi hasn’t heard that the Civil War ended almost 150 years ago, but the sight of all this “Rebel” pride is somewhat offensive to me and must be really offensive to anyone who is African American. I am not surprised at all that Blacks didn’t come to the tailgate. 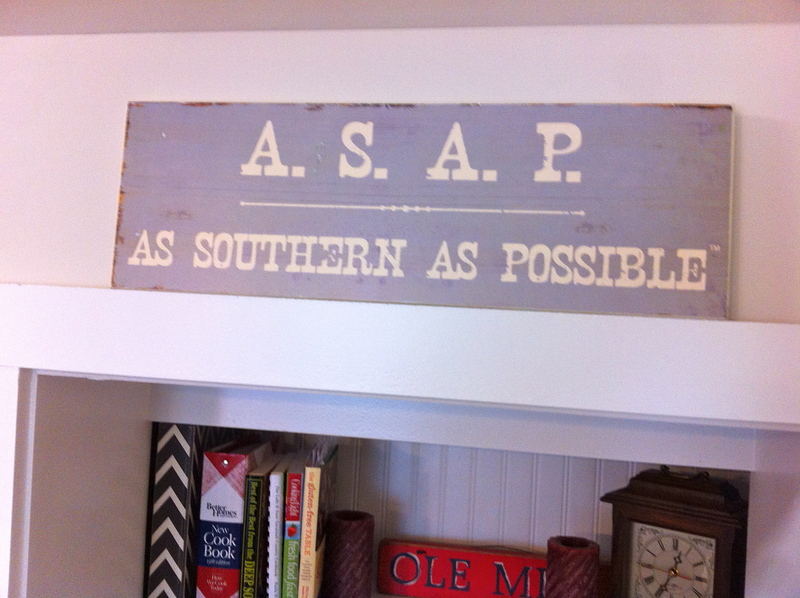 There is definitely a line between Southern culture and racism. I believe that Ole Miss is toeing that line. 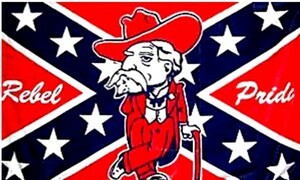 An Ole Miss flag featuring Colonel Reb. This brings up the point: Why would any black person ever play football for this school (or the bigger question, why would a black person ever attend Ole Miss)? I thought about this and I have a theory. While the African American football players may hate the school traditions of Ole Miss, they all have the goal of one day playing in the NFL. Not many schools recruit in Mississippi, so the kids who get the scholarships are going to accept the offer because it is their best shot at making it to the NFL. Mississippi is the poorest state in the country, therefore most kids (black or white) cannot afford to go out of state for school and the University of Mississippi offers the best education and the best football program in the state. While they would probably want to change the school’s traditions, black students chose to come to Ole Miss because it leads to the best opportunities in the future. The black students and student athletes come to a university for an education/football career, not for traditions. Two hours before 6:45 PM game time, everyone at the tailgate crowded along the only paved path in the Grove called the Walk of Champions. The team, led by the coach walked through the path and high-fived the Rebel fans for about a half-mile all the way to the stadium. Walk of Champions- the team is in the red sweatshirts. After the Walk of Champions, the sun began to set and the tailgate moved into the night. The Christmas lights on all the tents began to light up, creating a beautiful atmosphere. Julie and I then went back to the Birmingham tent to check-in with Alex and Kristin. Turns out they did not want to go to the game due to the weather, so it ended up being just Julie and me (again) going. When we walked in the stadium, the sun had set and the temperature was dropping fast. The high that day was 48 degrees, but when we walked into the stadium, it was 39 degrees. Despite the cold weather, most of the girls were still wearing dresses with light coats and looked awfully cold. Although our tickets were for the Mizzou section, we decided to sit in the Ole Miss student section, which surprisingly did not require any sneaking around. The pregame was highlighted by an incredible, intimidating entrance by the team where the student section and team swayed before the team ran onto the field with fanfare. One other odd thing, during the National Anthem, the student section talked loudly and did not take off their hats. 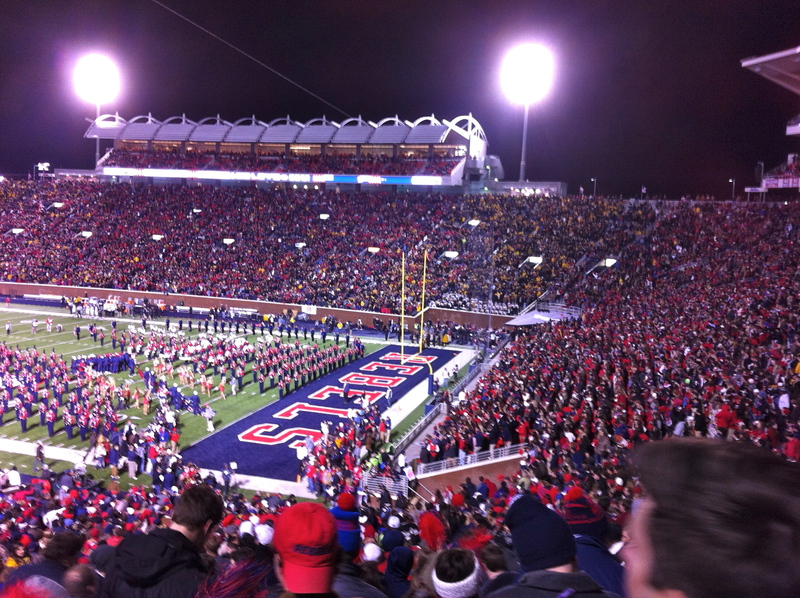 Unfortunately for Ole Miss fans, Mizzou was a much better football team and the fans very quickly got angry. During bad plays, many of the fans nearby would curse and throw bottles and cans. The most amusing part of the game was the constant advertisements for the 3 Chick-Fil-A locations in the stadium. 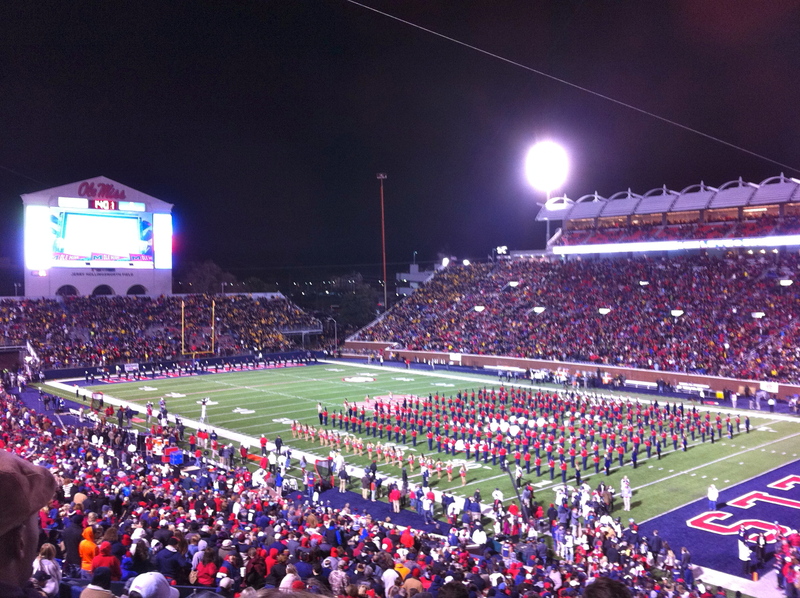 At halftime, Ole Miss was down by 14 points and the temperature was down to 34 degrees. It was around this point in the game that I realized that the thin khaki pants that looked nice during the tailgate are not quite as warm as jeans and I started to lose sensation in my legs. To counter this, I kept walking in place. At the end of the 3rd quarter, the band and cheerleaders went on the field to play a mashup of Dixie, the anthem of the Confederacy and a few other songs. Until 2009, the band played a song called “From Dixie With Love” which combined Dixie and Battle Hymn of the Republic. Where the words, “His Truth Is Marching On” are normally sung the people would yell “The South Will Rise Again”. Apparently, it became a tradition during the early 2000’s. Due to the obvious PR problems associated with yelling this, the school banned this version of the song in 2009. In the middle of the 4th quarter, it became apparent that Ole Miss was going to lose the game, so Julie and I decided to leave and walk back to Alex’s house. About 30 ice-cold minutes later, we made it back thanks to the help of Google maps. We then watched the TV show Trailer Park Boys while drinking beer for an hour or so with Alex and crew. We then ordered fried chicken sandwiches from a place called Coop de Ville before heading back to Kristin’s house to go to sleep around 1am. The next day, we awoke relatively early so we would have time to get back to St. Louis during the daylight. While I have been quite critical of the school traditions at Ole Miss on this blog post, I have an overall positive impression of Ole Miss. 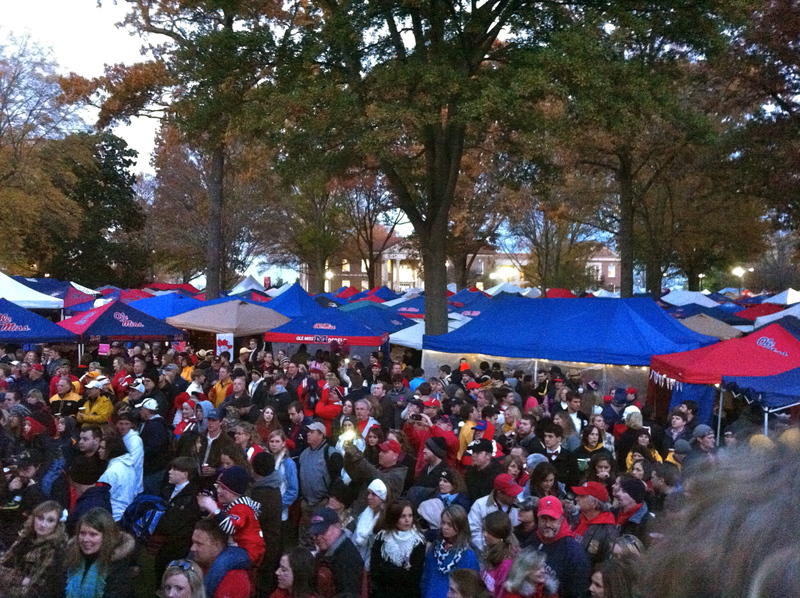 The tailgating is like nothing I have ever seen before and it is worth coming to Oxford to see this spectacle. Additionally, the hospitality I received from complete strangers was incredible. While I disagree with some of the school’s traditions, I would still come back to Oxford and the Deep South, but probably on a warmer date. What a great blog! Very astute and entertaining observations. Almost like being there. I have come to see the confederacy, as shameful. Really, people killing hundreds of thousands of Americans to keep the right to buy and sell, mothers, fathers, and children for profit and breeding, no matter familys broken up, cause Mr jones will pay more for the light skinned girl, but don’t need the brothers and sisters. Proud southern heritage? Come on, you black students, be rebels? Play for the stars and bars? go figure.